Last weekend was Round 3 of the BEMSEE 2016 season and it took place at Silverstone on the International/south circuit. MRO Minitwins to start, I qualified in 23rd with a laptime of 1:20.613, 3 tenths of a second outside of my personal best from 2014. Race 1 was a wet affair and I went backwards to 28th with a fastest laptime of 1:34.774. 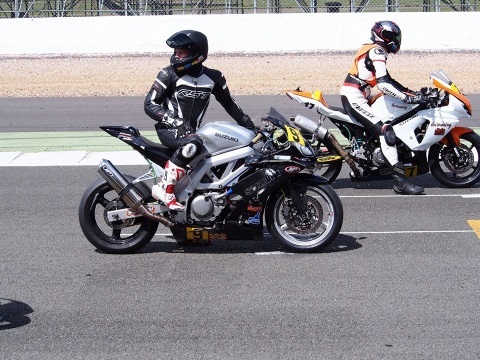 The last time I raced Silverstone in the rain I dropped the bike so was over cautious and as I got to grips with the conditions the race was red flagged. Race 2 happened on Sunday morning due to a lack of time on Saturday, I made my way up to 25th with a fastest time of 1:21.015. In Race 3 I managed to get up to 19th with a laptime of 1:19.197 and finally in Race 4 I managed to finish in 16th, just outside of the points, with a laptime of 1:18.375. In the Thunderbike Sport championship, I qualified in 18th with a time of 1:21.972. In Race 1 I finished in 16th with a time of 1:20.647. In Race 2 I finished in 14th with a time of 1:20.479. In Race 3 on Sunday I finished in 13th with a time of 1:19.277 and finally in race 4 I finished in 11th with a time of 1:19.555. I had some great battles this weekend with old and new competitors and I feel like I am gelling with the bike more and more every time I ride it. I was hoping to change the front suspension this weekend but that had to be delayed so next time out I hope to have a more suited front setup to my current weight.